There were a few raised eyebrows on the streets of central London today after a 3 tonne polar bear went on the rampage. It was actually a puppet - operated by fifteen puppeteers. But thousands came to see it nonetheless. It was part of an international day of action against drilling in the Arctic. A three-tonne polar bear puppet, the size of a double decker bus, is heading to London as part of a worldwide campaign to raise awareness of the Arctic and changes to its environment. The puppet will be operated from the inside by a team of 15 puppeteers as it makes its way along a route including the Houses of Parliament and Westminster Bridge on 15 September. 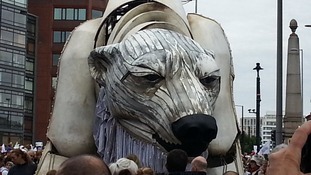 The giant bear, which is made of replica and reclaimed ship parts as well as recycled materials, will be carrying in her fur the names of over 3 and half million people who have joined a global movement to protect the Arctic.